Book Review: Another Steve Jobs Biography? Yes, there is already an ‘official’ biography of Steve Jobs written by Walter Isaacson. So why do we need another one? The authors of the new biography claim that Isaacson’s biography added nothing new to the public’s knowledge, and that it did not delve deeply into the years between Steve Jobs’s dismissal and eventual return to Apple. They said this was a transformational period that allowed a creative, visionary, tantrum-throwing, often-arrogant founder in his early twenties to eventually become the CEO of the most successful company on the planet. To be honest, I was a bit skeptical about the book. Steve Jobs’s life has always been a popular discussion topic. With a movie and a book already out, and another movie coming soon, there has been no shortage of mainstream attention to the man’s life either. Further, the open endorsement from Apple for the book actually reduced its credibility a little bit for me. But after researching about the author Brent Schlender, I decided to give it a go; the author being a respected technology analyst for Fortune, who has covered the computer industry for more than 30 years. The book is certainly not a quick read at 400+ pages. But it is well-paced. It is divided into chronological chapters, with each chapter having multiple sections within it – often used for detailing different threads of Steve’s life at that time. We start from his childhood and finish with his death in 2011. For someone who is interested in the computer (now mobile, mostly) industry and cares about its history and evolution, the book is a fascinating journey. In that regard, it’s not just about Steve and Apple. Bill Gates, Andy Grove (co-founder of Intel), Michael Dell, John Lassater (Chief Creative Officer at Pixar), Ed Catmull (CEO of Pixar), Bob Iger (CEO of Disney), and of course Steve Wozniak, are just a few of the titans that appear in the book. At the end of the book, a notes sections details how the facts presented in each chapter were derived: interview details, online links, etc. It’s worth noting that the authors have even referred to and cited Quora, specifically this answer, as part of the narrative. 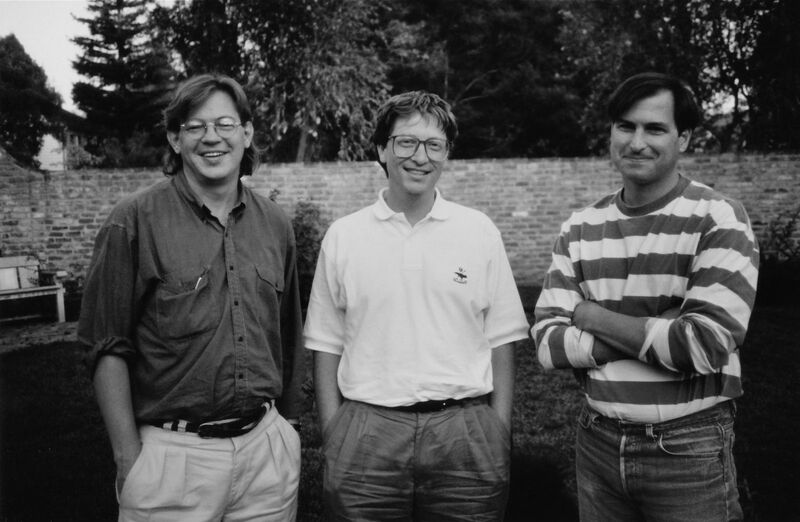 Author Brent Schlender with Bill Gates and Steve Jobs after he conducted one of their only two joint interviews, in 1991. The book does deliver on its promise of focusing on how Steve Jobs changed himself to be eligible to become a successful CEO at Apple. The story is not sensational, but a transformational one. While most of us aren’t facing the problems faced by Steve Jobs (and we may never), it is interesting to see, and learn from how changes to his personality and thinking led to tangible decisions and results, both good and bad. It is also great to learn about the inside stories at both Apple and Pixar, especially since Apple is a very tight company as far as internal details go. We also get a snapshot of the personalities of many of the other key players in the computer industry. The anecdotes they have shared from their personal experiences with Steve Jobs are insightful and fun to read. I enjoyed the book. The authors – Brent Schlender and Rick Tetzeli seem to have done their homework well. What really works in their favor is the fact that Schlender has covered Steve Jobs for more than 25 years. Apart from all the archival data and their own notes from the past, it’s the ‘off record’ things that give the authors an edge over other biographies of Steve’s. For most part, the authors reflect upon his life objectively, without any bias. From a purely management point of view, there might be too many ‘distractions’ for the reader. But if you love technology and its history, the book is certainly worth your time. That is quite surprising, but true! We have come to think of Steve Jobs’s stories as sensational, over-the-top ones that have a dramatic (good or bad) ending. Just a query though. I haven’t read any book on Steve Jobs, but want to read one desperately. In that case, which one would you recommend as a reader and as a technical person. Thanks Shardul! I would recommend ‘Becoming Steve Jobs’ if you want to know about how he had to change himself to become a successful leader and CEO. However, if you’re not too familiar with his life story, and the major events in it, then his official biography by Walter Isaacson provides good details.